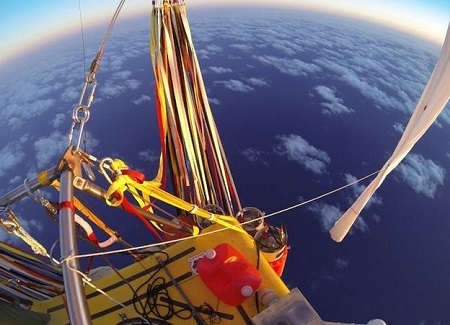 Two pilots have surpassed the world distance record for a flight in a helium balloon after crossing the Pacific Ocean. American Troy Bradley and Russian Leonid Tiukhtyaev also hope to set a new duration record. 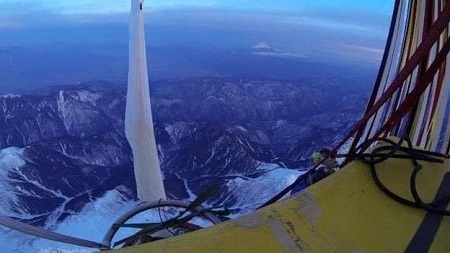 The gas balloon took off from Saga, Japan, on 24 January. They left Japan in their “Two Eagles” balloon on Sunday and had aimed to land in Canada or the US. 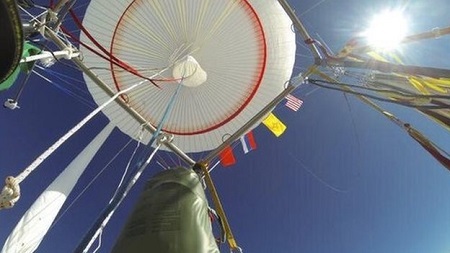 Their hi-tech balloon is made of a strong Kevlar and carbon-fiber composite, but weighs only 220 pounds (100kg). It is fitted with monitors and other instruments that track their course and compile data to be submitted to record-keepers. The balloon is set to land in Mexico after weather conditions changed the flight plan. 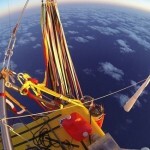 The Two Eagles balloon is capable of staying aloft for up to 10 days . The color-coded cords help the pilots know how much ballast or expendable weight is used during the flight. On its website, the team says Two Eagles will not have “broken the record” until documentation is approved by the US National Aeronautic Association followed by the Federation Aeronautique Internationale – a process that could take several weeks or months. The existing duration record they hope to beat was set in 1978 when three pilots made the first trans-Atlantic balloon flight, spending 137 hours, 5 minutes and 50 seconds in a gas balloon. Americans Ben Abruzzo, Maxie Anderson, and Larry Newman travelled on the Double Eagle II balloon from Presque Isle, Maine, to Miserey, France, about 60 miles northwest of Paris. Two Eagles should pass the existing record about 15:50 GMT. 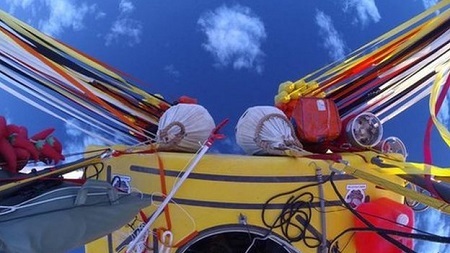 To set a new record, the team must stay aloft for about 138 hours and 45 minutes. Crew members Mr. Abruzzo, Mr. Newman, Ron Clark and Rocky Aoki made it from Nagashima, Japan, to Mendocino National Forest in California in 84 hours and 31 minutes. The current team named its craft in honor of the existing record holders. Two Eagles can stay in the air for a maximum of 10 days; it’s now day five of the journey. A network of balloon enthusiasts has been organized to act as chase crews, but correspondents says it remains unclear if the balloon will be able to land in a place where a ground crew can help them. The Two Eagles craft is a helium-filled gas balloon. “Roziere Balloons,” which use both hot-air and gas, are the only ones that have circled the earth. The craft is about five feet wide, seven feet long, and five feet high, weighing only 220 pounds. This entry was posted in Balloons, Helium Balloons and tagged balloon flight distance record, balloon flight-duration record, helium balloon, Leonid Tiukhtyaev, Troy Bradley, Two Eagles. Bookmark the permalink.